I remember the first time I heard that a friend’s parents were divorcing. I must have been 7 at the time, and I didn’t understand. Was that possible? People were allowed to do that? It didn’t seem right. More than that, it seemed wrong. Growing up, I didn’t know my biological dad, and my mom married my stepdad when I was 4 so I remember little before him. They had a fine marriage, but there were always issues. Even as a kid I was aware of that. Money, church, friends, attitudes, other attractions, the chore of children … these things weighed on my parents. There were times I thought their marriage was over, but then they’d come back together again—until the time they didn’t. I remember the moment my stepdad told me that he had filed divorce papers. My parent’s divorce wasn’t unexpected, but my heart ached all the same. He’d been waiting to tell me because I was planning my own wedding. But the day he chose to tell me was my wedding day. Yes, my wedding day. He didn’t want me to be surprised, when I returned from my honeymoon, that he was living someplace else. I can picture your dropped jaw . . . and I felt the same shock and disbelief as I drove away later that day with my new husband. I was 18 years old and newly married, but something still felt wrong about my parents getting a divorce. I felt like a hurt kid inside. For a child, things never seem “right” again after your parents divorce. It was weird to see my mom without my dad there. It seemed weird to have to go to two Christmas gatherings, two Thanksgivings. It’s the most unnatural thing in the world. Another thing you can’t shake as a child of divorce is the feeling that it’s partly your fault. I went through some very rocky years as a teenager, and I caused a lot of stress for my parents. During my junior year of high school, when my mom wondered if she should leave my stepdad and get her own apartment, I told her I thought she should. Even though my input had very little effect on their decision, I still feel guilt. It’ll always be there. There’s always a feeling that if I’d been a better kid it would have been easier for my parents to work it out. 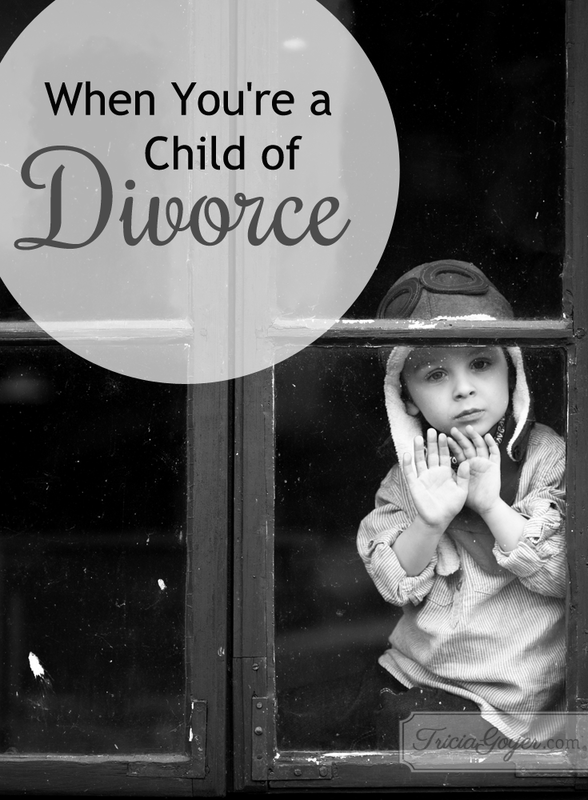 The truth about being a child of divorce is that it hurts no matter how old you are. This is not how God created things. A commitment is a commitment, especially one made before God. I’ve been thinking about this lately because if my generation has anything in common, it is our universal exposure to divorce—not only with our parents, but in our marriages. If you’re alive today, divorce has had a profound effect on you—financially, emotionally, morally, spiritually. Our lives are different because of what has happened in our country’s marriages. And where does that leave us? As people who understand the pain and struggle, it’s our job to help strengthen marriages—those around us and our own. Sure, you might think your friend has a good excuse for divorce, but don’t encourage it. Encourage forgiveness, grace, and reconciliation. Pray. Pray hard. Pray for the couples out there, and pray for their children. We’ve seen enough hurting kids grow into hurting adults. And if you’re considering a divorce yourself . . . I beg you to reconsider. The grass is not greener. Happiness is not found in someone else. Love can be rekindled. The best thing you can do for yourself and for your children is to give your marriage a second chance. Don’t think that walking away from your commitment will come without consequences. Don’t think you’re not going to break your children’s hearts. If you don’t want to try again, take your hurt and pain to God. Tell Him that the love is gone and seek His help. Love can sprout where you think there is only dead, dry ground. God can do miracles, and He wants to start in your heart. Strengthen the marriages around you. Pray for couples and their kids. Thank you for families and for marriage. Being married is a calling, and it’s hard work. Help my spouse and me to work through our differences and to show each other love and forgiveness. May our marriage encourage those around us who might be considering divorce. Thanks Tricia, but can I ever forget what I went through growig up? It hurts real bad. Juliet, it does hurt, doesn’t it? Go to God and His Word and ask Him to speak to your heart about your pain. Do you have a trusted friend that you can talk to about it, too? While I would love to believe with all my heart that divorce is wrong, there are some marriages that should not be saved. I grew up with a mom that has been married 5 times. While the divorces were painful, they were justified – there was physical abuse, and childhood sexual abuse. There is absolutely no way I would ever want my mom to give any one of those men a second chance. Those men took advantage of a weakness and they did it without caring about the damage they inflicted. I myself have been married for 27 years, we have had some ups and downs, I love my husband, he has been a fantastic spouse and father, but we both agreed before we married that if there were ever any beating or cheating then there would be no marriage. I am blessed that none of those things has ever happened. However, sometimes the only thing that has saved my marriage throughout the years was the constant praying. I completely agree, Charlene!! In the cases you mentioned divorce is the only way to peace, wholeness, and healing. I also agree that some people do not deserve a second chance in marriage! I also know that in the majority of cases people divorce for far less. I still LOVE my divorced parents. I have divorced friends who I love, too. I just want readers to have an inside glimpse of the pain it can cause. If it can help one reader reconsider throwing in the towel on a marriage that can be saved then it is worth it. I have typed and erased so many responses, but they all sounded so judgmental. If just one marriage can be saved through prayer and counseling that is wonderful. Divorce is way to easy these days. A song lyric keeps playing in my head “Divorce is just another word for nothing left to say.” Communication is the key in all things. I also still love my divorced parents. My dad had issues after returning from Viet Nam. He was not the same person and became physically abusive towards my mother. He got help for that and in later years regretted what he did. But I am so glad that my teenage self that tried in many ways to get my parents to reconcile never succeeded. By that time they were so wrong for each other, that it would have ended in another divorce. Charlene, hugs to you friend!! I’ve never heard that song lyric before. Powerful. I can understand where you are coming from. I, myself, am not a child of divorce; but my 2-year old son will have divorced parents soon, God Willing. I wouldn’t consider my son a child of divorce, because since his birth, he did not get to know his father as a father. Right after I had my son, the person who is now my husband made my life nearly impossible; I could not read the bible, pray, go to church, or do anything freely, which left us (my son & me) forced to leave our home when he was just about 6 months old. My child knows my own father as his father, so I wouldn’t say that this divorce will cause immediate hurt on him. Just a thought, God Bless! Gilana, Every story is so different. I’m so thankful that your son has you. I know you are doing what is best for Him as you seek God. HUGS! Wow Tricia…you have gotten some really heartfelt comments on this one. It’s hard isn’t it…when there is so much in your heart about a subject but you only have a few words on a page to explain it? I found your words to be so true…and I also instinctively understood that you were telling this from the perspective of the impact on divorce through the eyes of a child…and specifically, you. Of course God doesn’t expect women (or men) to take physical or mental abuse. That destroys families and the higher good is to keep ourselves and our children safe. But God (and we ourselves) would absolutely love it if our families were healthy and divorce was not part of the equation. And it does have a great impact on the children. I divorced and remarried (more than once) and it wasn’t until I understood my part in being drawn to unhealthy relationships (and why these men were drawn to me) that I ‘got” it and will be celebrating my 20th anniversary to a very special guy in June. Congratulations on your anniversary and your thoughtful words! I appreciate it! Your article is very true both spiritually and emotionally. My parents were divorced when I was an infant. They were married 4 times each. I suffered spiritually and emotionally until I was nearly 30 years old. I was angry with them and God. It took 3 years of weekly counseling sessions at http://scopeministries.org to heal from the less I believed about God, myself, and the world. I was also blessed at that time to have Dennis Jernigan as the worship leader at my church. With this combination I was able to find the Father-heart of God and sore Him to heal me. God called me to be a Marriage and Family Therapist to minister to couples and families so the rate of divorce is reduced, especially in the Body of Christ. God established marriage and family. He gave us all we need for life and godliness in His Word. In Malachi 2 God says He hates divorce because He wants godly offspring from the union. I pray couples stop believing their children will adjust to whatever they subject them to. We need men to be husbands and fathers and women to be wives and mothers. Our children’s future is at stake. Sorry, my phone typed sore…it should be allow. Wow, what a powerful story! It’s one of using the “mess” you faced as a “message” to help others! Amazing! Great words. My parents separated when I was 17, divorced when I was 18. I got married when I was 20, and several people expressed surprise that I would marry when I was that young, but also because it was so close after my parent’s divorce. It’s taken me a long time to fully work out the anger and hurt from my parents’ divorce, and I don’t think I’m there yet at 32. In the nearly 12 years since I married, I’ve watched other couples on the verge of divorce, and some reconciled and have a great marriage now, and others have divorced. I think because I was an adult (or darn close to it!) when my parents split up, I can see their faults, and am on the lookout for similar flaws in my own marriage. I know the errors they made, and am very careful not to repeat them. For instance, it seemed to me that my mother arbitrarily made the decision to homeschool my sister and myself midway through my school years, that my dad had no input whatsoever. My husband now is unsure about my ability to homeschool our children because of my personality and my own poor experience being homeschooled. Instead of fighting him on it, we’re getting advice from others and going to a homeschool convention TOGETHER (my dad never attended one) where we can go to seminars on first year homeschooling. I love how you learned from your parents marriage and divorce and are aware to make yours stronger! Divorce is hard to get over, but I know God can bring a lot of healing! I agree about your article Tricia, that divorce should be avoided at all cost, that couples should always strive to fix their problems when they can… I still love my husband and do not want to file for divorce, but what else am I supposed to do? I found out that he had been cheating on me three months ago, I gave him one week to make up his mind and choose between me and her… He picked her, told the kids that mommy and daddy were not going to live together anymore, called his girlfriend to pick him up and left. My heart shattered in a thousand pièces that day, I wished i could have died, it hurt so bad. We separated, he didn’t want to divorce and said he still loved me, so I gave him three months to change his mind and leave her. He comes every Saturday to visit our three kids, most times he just takes them someplace fun with his girlfriend… I hate it, but the kids are little and do need their dad, so I do put up with it for their sakes. We are going through counseling but he is still with that girl right now and doesn’t seem any closer to be making a decision than before, except when I told him of my plans to say goodbye myself, he begged me to “not discard him yet” -hence the counseling. I feel like this could drag on and on for months, at least, and I am going crazy, not to mention the torture he put me through since the beginning of January, all the things he reproached me to justify his affair -this is seriously a nightmare. We have been friends for 15 years, he was the love of my Life, but I cannot take it anymore. He is not the Man I married anymore. I sacrificed so much for him -my country, my family, financial security… I feel like a rug he used to wipe his muddy feet on. I am thinking that sometimes divorce IS the best solution. This isn’t the correct format for private discussions, so I don’t really want a response to my musing. I’m curious as to what goal your counseling is trying to achieve? As a Licensed Marriage and Family Therapist Associate the only counseling I would do, with him living with the other woman, is separation or divorce counseling. I would not engage in couples reconciliation/repair counseling as long as he isn’t completely committed to your marriage. This is very traumatic for you. At this point I might see you individually to help you determine your path, but never couples counseling. I pray your husband comes to his senses, realizes the damage he is doing, and turns his heart and mind back to his wife and children. I’m so sorry you and your children have suffered so much. I’m so sorry that you have to go through this! Do you have a counselor you can talk to? It’s so sad when people make selfish decisions and so much pain is left in the wake! My parents divorced when I was 3. I remember crying myself to sleep a lot because I missed my mom and just wanted my parents to be back together. It had a huge impact on my life. I am fully committed to my husband and we both have gone through a lot but refuse to even consider divorce as an option. My heart breaks when I hear of friends divorcing especially when they have children. 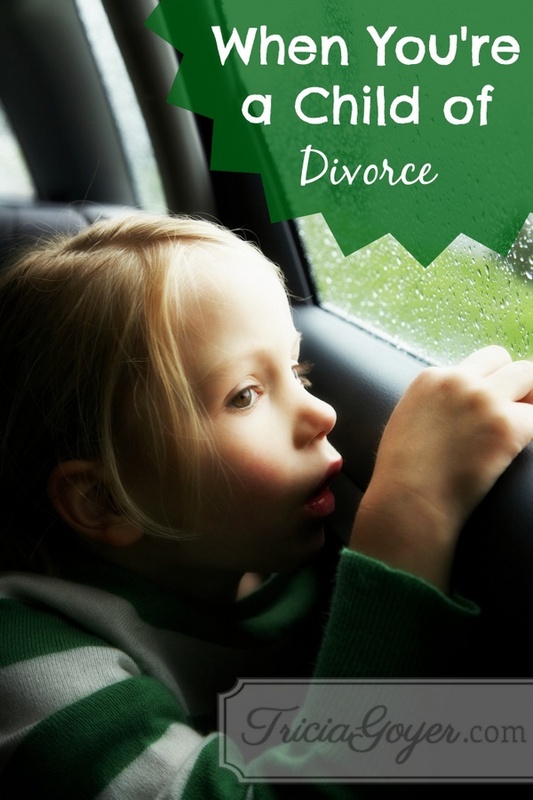 I think the impact divorce has on children is really downplayed. I’m so sorry that you had to go through that. I agree that the impact on children in downplayed. I know it plays in to more than I realize. I’m praying for a friend right now. Encouraging her to seek God’s will about her situation. It’s so tough knowing that she’s hurting so much and that I am unable to do more. So I’m fighting in prayer for her marriage. As for myself, I’m single and have never been married. It’s a discouraging world out there, and the frequency of divorce plays a huge part in that. I want to believe in the fairy tale “happily ever after” because that’s the way God intended it to be (with the final HEA being reaching our home in Heaven), yet this world says that’s not possible. I still believe it, though. With God, all things are possible. I’m praying for and waiting on that right guy who will view marriage the same way I do, that it’s a sacred bond in the eyes of our Lord. Thanks for the lovely article, Tricia. I’m sorry you experienced that shock on your wedding day, but I’m glad you and your husband are together and raising some pretty amazing kids. Surely your experience will help the next generation to stand up for their marriages in Jesus’ name. That’s wonderful that you’re praying for your friend! Also, don’t give up hope for yourself! I’m praying God will bring you a buy who is as dedicated to marriage as you are! No truer words were ever spoken. My husband divorced me last year, and there has been and still is so much pain for me and my children. I beg anyone who is considering a divorce to not do it. I’m so sorry, Darla! May Jesus bring you peace.